・Please refrain from using megaphones. ・Please refrain from loudly jeering at the racists (there is, of course, no limit to the amount of silent insults you can throw at them, such as giving them a thumbs down or the middle finger). ・Please ensure that sidewalks are not blocked (particularly in front of stores). ・We are going to try and get as many placards as we can on the side of the street that the hate speech demonstration is going to be walking along (Area A and B on the map). Please don’t limit yourselves to the crossroads itself, but spread out lengthways making sure that the sidewalks are not blocked. Let’s confront the racists with placards, banners and gate flags right under their noses. ・Due to this protest being a silent protest the verbal abuse of the racists will be far more audible than usual. Those participants who feel uneasy at the prospect of hearing such abuse should gather on the opposite side of the road (Area C and D) and raise their placards there. 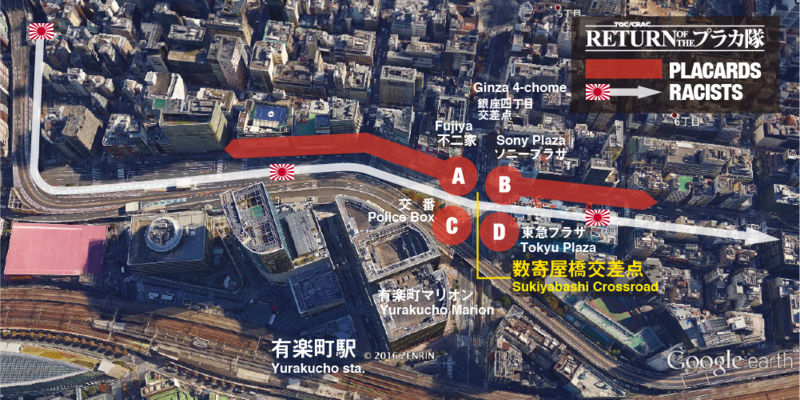 ・As the hate speech demonstration approaches Sukiyabashi crossroad all pedestrian crossings will turn red and become uncrossable. Those participants who are planning to protest in Areas B and D should make sure they are in position well before the demonstration approaches. ・TQC members will be present at each of the 4 Areas (they will be wearing identifiable armbands). If you are unsure about anything at all, feel free to ask them at will about the action. They will also be handing out placards and collecting signatures for a petition.